Please click here to access organised tours specially put together by Aqua Tours for delegates of the ICPCN conference. The city of Durban, in the province of KwaZulu Natal, is one of South Africa’s most popular tourist destinations. It is a natural paradise known for its stunning coastline of sun-kissed beaches and subtropical climate, situated on the eastern seaboard of Africa. The City is built around one of the busiest ports in Africa and is home to a vibrant blend of people from numerous and diverse cultures. In the city of Durban you will experience a warm African flavour that will capture your heart forever. Durban is the third largest city in South Africa and the country’s leading holiday resort. The world’s oldest and largest ultra-marathon, the Comrades Marathon, takes place annually and is run between Durban and Pietermaritzburg. 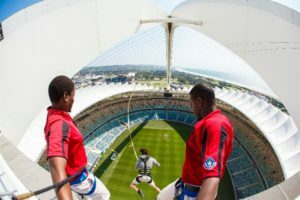 The world’s tallest bungee swing is found at the Moses Mabhida stadium (Guinness Book of Records, 14 May 2011) in Durban. The greater Durban area is home to Gateway Theatre of Shopping, the largest shopping mall in the southern hemisphere. The Durban Aliwal Shoal is considered as one of the world’s top diving sites. Durban is the home of the 9th largest harbour in the world. The modern Port of Durban grew around trade from Johannesburg and today the city has the busiest container port in Africa. Durban is home to the one of the largest populations of Indians, outside of India. The spiritual leader of the Indian independence movement, Mahatma Ghandi began his political journey in Durban. Durban is one of the top surfing destinations in South Africa and the world. Durban is the busiest port in South Africa. It is a popular tourist destination due to its warm subtropical climate and extensive beaches. The waters of the Indian Ocean are temperate and swimming is possible all year round. Situated on the east coast of South Africa, the tourist attractions in Durban and surrounds are multitude and very unique. The city is one of the most diverse in Africa with a cultural richness of mixed beliefs and traditions. Zulus form the largest single ethnic group and Durban has the most Indians of any city outside of India, bringing with them a variety of cuisine, culture and religion. 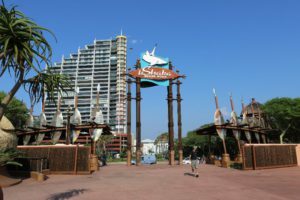 The conference venue is situated on the Golden Mile, a popular stretch of beachfront, including the promenade that runs along with it, that runs from uShaka Marine World to the the iconic Moses Mabhida Stadium, built for the Soccer World Cup held in 2010. 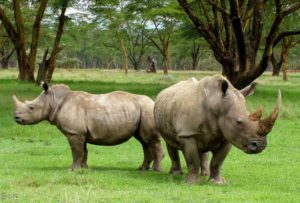 The city is also a gateway to national game parks and historic sites of the Zulu Kingdom, the City Hall, the Botanical Gardens and the Drakensberg, a spectacular mountain range. Watch this timelapse video highlighting scenes from the beautiful city of Durban. Wikipedia describes Durban’s Golden Mile as the popular stretch of beachfront and promenade that runs roughly from South Beach (where the uShaka Marine World is located) to Suncoast Casino and Entertainment World in the north and includes a route directly to Moses Mabhida Stadium. It abuts the central business district of the city to its west. 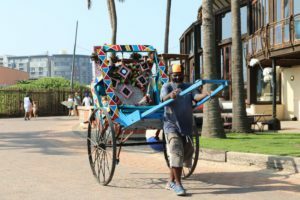 It is possible to hire bicycles should you prefer to ride along the promenade, or to catch a ride with one of Durban’s famous Rickshaw drivers. It is one of the main tourist attractions in the Durban area. The wide stretch of golden sands, artificially separated by various piers, provides excellent opportunities for sun-worshippers and swimmers to enjoy the sub-tropical sunshine and warm waters of the Indian Ocean. Most of the Mile’s beaches are protected year-round by lifeguards and shark nets. The Mile is also a well-known surfer’s haven. The beachfront properties are a mix of residential apartments and tourist hotels, development of which boomed in the 1970s, although remnants of Durban’s art-deco architecture are still evident. Interspersed among the beachfront properties are several popular restaurants and nightclubs. The Elangeni Hotel (ICPCN Conference Venue) is situated along the Golden Mile. Durban’s iconic Moses Mabhida Stadium offers a variety of experiences and attractions. Take a trip on the SkyCar or make the 550-step adventure walk to the top of the arch and enjoy panoramic views of the Indian Ocean and Durban. Or take a look inside the stadium with an all-access (90 minute) or general (45 minute) tour. For adrenaline junkies, try plunging off the 106 metre arch on the Big Swing. The SkyCar gives you the chance to discover Durban from a 106m-high vantage point. Look one way and take in the ocean views as far as the eye can see, look the other way and you’ll see the city living for miles. Mounted on an undercarriage, the SkyCar is a single cabin that runs up steel tracks on the northern arch of the stadium and is designed to roll down the arch under its own gravity – this enables it return to the lower station, even in the event of a power failure. The Big Rush Big Swing has been officially named the world’s tallest swing by the Guinness Book of Records since 14 May 2011. Not your average swing, the aptly named Big Swing allows you to take the thrilling leap swinging out into a massive 220m arc where you soar into the centre of the stadium. Go on, take the leap. The Botanic Gardens is Durban’s oldest public institution and Africa’s oldest surviving botanical gardens. The gardens cover an area of 15 hectares in a subtropical climate and were developed in 1849 as a botanic station for the trial of agricultural crops. Visitors can stroll among the indigenous and exotic subtropical plantings, including majestic heritage trees, some of which are more than one hundred years old. The main plant collections include cycads, orchids, bromeliads, and palms, and visitors can also experience the Garden of the Senses. In addition to the rich plant biodiversity, at least fifty different species of birds are permanent residents of the gardens. Encompassing the Victoria Street Market and Juma Masjid Mosque, the largest in the southern hemisphere, Durban’s Indian Quarter is a multicultural mix of sights, sounds, and exotic aromas. Chinese, Pakistani, Indian, and Somali street vendors haggle along the narrow pavements, selling everything from spices and saris to beaded sandals, incense, and intricate, handmade jewelry. Shoppers will find some good bargains here, and the restaurants boast some of the most authentic Indian cuisine in Durban. Situated in Umhlanga Rocks, a 15 minute drive north of the Elangeni Hotel, the Gateway Theatre of Shopping is the ultimate retail and entertainment destination. Find everything under one roof in this super regional shopping centre that hosts some of the most elite retail stores in South Africa. Gateway Theatre of Shopping is the ultimate fashion, entertainment and dining destination in Durban. With over 390+ stores, 70 eateries and a host of exciting entertainment, visitors are spoilt for choice! 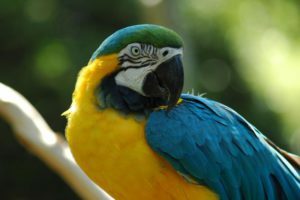 Just 10 minutes outside of the city, the Umgeni River Bird Park is one of Durban’s best attractions. With walk-through aviaries, birds out on perches, wonderful green vegetation, some amazing waterfalls and rock faces. You will be able to see owls, cranes, hornbills, macaws, kookaburras, toucans, vultures and many other species as they demonstrate what they would normally do in the wild in totally unrestricted free flight. Free flight Bird Show: The first in Africa features critically endangered species like the Wattled Crane, as well as owls, storks, hornbills and a Cape Vulture in free unrestricted flight, the emphasis is on conservation and education. Just a 35 minute drive from Durban, the Valley of 1000 Hills is named after the many hills, cliffs and valleys which rise up from the banks of the Umgeni River as it flows from the distant Drakensberg mountains to the Indian Ocean. The valley has been home to the Zulu people for centuries, with many continuing to practice and live their unique traditional lifestyle. Explore the roots of Zulu culture by taking an organised tour deep into tribal lands. You can witness ancient Zulu ceremonies, as traditional diviners ‘throw the bones’ and communicate with their spiritual ancestors at pheZulu Safari Park. 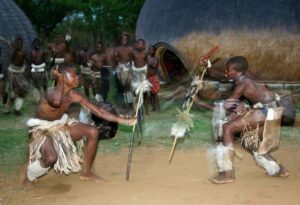 PheZulu also offers traditional Zulu dancing and cultural shows, as well as game drives, local curios, wonderful views across the valley and a crocodile and snake park. The KwaZulu-Natal coastline is the only coastline with 37 beaches equipped with bather safety gear owned and maintained by the KwaZulu-Natal Sharks Board Maritime Centre of Excellence in South Africa. The public can enjoy early morning boat trips out to sea to observe staff at work. Here one will witness the checking of shark safety gear as well as stand an excellent chance of spotting a variety of marine life such as dolphins, sting rays and porpoises. For a more in-depth look at Durban’s multi-cultural population and a history of the city, watch this recently made National Geographic documentary.